"SANTI embodies the qualities I value most in a company, having arisen from a history of agressive technical diving and focused on building the most innovative and best quality equipment in the industry." Jarrod Jablonski is an avid explorer, researcher, author, and instructor teaching, and diving in oceans and caves around the world. 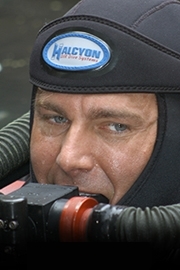 Trained as a geologist, Jarrod is the founder and president of Global Underwater Explorers (GUE), the CEO of Halcyon Manufacturing as well as Extreme Exposure Adventure Center while remaining active in conservation, exploration, and filming projects worldwide. His explorations regularly place him in the most remote locations in the world, including several world record excursions at 300feet during cave penetrations in excess of 25,000feet/7km; these dives include bottom times of 12 hours with total immersions of roughly 30 hours.